New investigations at an iconic cave site on the Channel Island of Jersey have led archaeologists to believe the Neanderthals have been widely under-estimated. 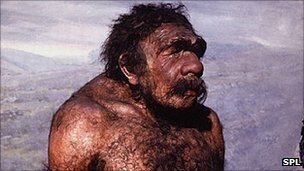 Neanderthals survived in Europe through a number of ice ages and died out only about 30,000 years ago. The La Cotte ravine has revealed the most prolific collection of early Neanderthal technology in North West Europe, including over 250,000 stone tools. These include stones with sharpened edges that could be used to cut or chop, known as hand axes. "Archaeologists have developed new ways of looking at stone tools since La Cotte de St Brelade was excavated in the 1970s," says Dr Beccy Scott from the British Museum and the Ancient Human Occupation of Britain project. "We have been using these techniques to look at how Neanderthals were making and using the tools they left at La Cotte." The huge amounts of carefully manufactured tools show just how technologically skilled early Neanderthal groups were. "The artefacts from the site don't just tell us about what people were doing at the site itself, but throughout the landscapes that are now underneath the channel," continues Dr Scott. "Neanderthals were travelling to Jersey already equipped with good quality flint tools, then reworking them, very, very carefully so as not to waste anything. They were extremely good at recycling." La Cotte's collapsed cave system contains intact ice age sediments spanning a quarter of a million years, revealing a detailed sequence of Neanderthal occupation and occasional abandonment, against a background of changing climate. "The site is the most exceptional long-term record of Neanderthal behaviour in North West Europe," says Dr Matt Pope from the Institute of Archaeology at University College London. "At La Cotte, we get to see far more than a glimpse of their behaviour, we get to see generation upon generation of Neanderthals returning to the same place under lots of different environmental conditions." 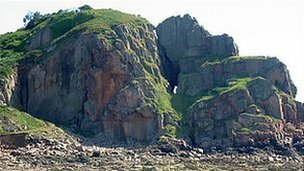 Jersey at this time was linked to mainland Europe and La Cotte would have been a sheltered cave, allowing occupation. Neanderthals abandoned the site during the coldest, glacial phases, when much of Britain was frozen. Understanding how they reacted to the onset of these cold periods will allow archaeologists a greater insight into the limits of Neanderthal tolerances. The site has been the focus of archaeological research for over 100 years and scientists believe more discoveries are yet to be made. "We are also starting to look beyond the site and into the waters of the bay with the purpose of attempting to find new sites preserved on the sea bed," says Dr Martin Bates from the University of Wales, Trinity St Davids. "We know from work around the Cotentin (peninsula in Normandy) that such sites exist and if we were lucky enough to find similar sites around Jersey, it would add significantly to our understanding of the Neanderthals and their landscape." Neanderthals looked much like modern humans only shorter, more heavily built and much stronger, particularly in the arms and hands. Their skulls show that they had no chin and their foreheads sloped backwards. The brain case was lower but longer housing a slightly larger brain than that of modern humans. As almost exclusively carnivorous, both male and female Neanderthals hunted. Evidence of a huge number of injuries - like those sometimes seen in today's rodeo riders - suggests that hunting involved dangerously close contact with large prey animals.